Pittsburgh Underground: Movies That Have Everything: Celebrate The Hollywood Theater Anniversary THIS SATURDAY!!! Movies That Have Everything: Celebrate The Hollywood Theater Anniversary THIS SATURDAY!!! The Hollywood Theater (1449 Potomac Ave, Pittsburgh, Pennsylvania 15216 / 412-563-0368) has teamed up with First Commonwealth to celebrate four years since it's community reopening (and about 88 years since it first opened)! The evening will feature special guest, actor Tom Atkins, and a brand new restored digital transfer of his film, the classic sci-fi/action movie John Carpenter's Escape from New York. Check out this trailer! Live music by The Retro Agents, hors d'oeuvres, birthday cake, beer and wine, and our annual auction featuring Penguins box seats, a free private night at the Hollywood for you and your friends, and much more! Doors open at 6pm, a conversation with Tom Atkins at 7:30pm, and the film shortly after 8pm. Tickets are $15 in advance at Showclix or $20 at the door ($12 advance for current members or $15 at the door, must show valid member card at door). Price includes two drink tickets. A Pittsburgh-born actor, Tom Atkins frequently acts in plays held at the Pittsburgh Public Theater, and has garnered plenty of recent accolades for his outstanding portrayal of Pittsburgh Steelers founder Art Rooney in the acclaimed one-man show "The Chief." He made his film debut as a rookie police officer in the Frank Sinatra private eye-outing The Detective (1968); it was the first of many police officer roles he has played throughout the years. 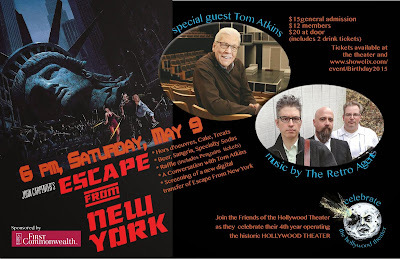 Tom appeared in two films for director John Carpenter: he is very likable as Nick Castle in the spooky ghost film The Fog (1980) and as Rehme in the fantastic futuristic sci-fi/action cult film Escape from New York (1981). Atkins had a nice small role as a disapproving and overbearing father in the immensely enjoyable Pittsburgh-made fright feature anthology Creepshow, directed by George Romero. He made for a touchingly flawed hero as Dr. Daniel Challis in Halloween III: Season of the Witch, and was impressive as the guilt-ridden heroin smuggler Michael Hunsaker in the exciting blockbuster Lethal Weapon. Among the television series Tom has done guest spots on are Oz, Xena: Warrior Princess, Walker, Texas Ranger, The Equalizer, Spenser: For Hire, The Fall Guy, Lou Grant, Baretta, and M*A*S*H.
For more information, you can check out the Official Hollywood Theater Website or the Facebook Event page. Hope to see you there!